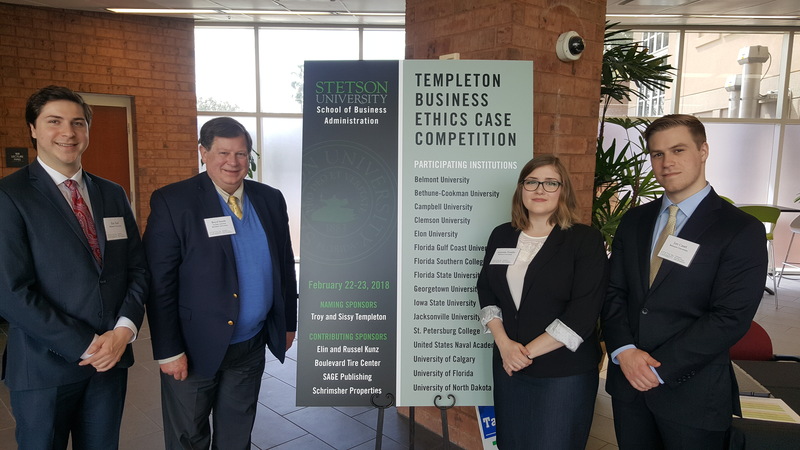 Belmont recently competed in the Templeton Business Ethics Case Competition at Stetson University in DeLand, Florida. Sixteen universities were invited to present their financial, legal and ethical analysis about a national pharmaceutical company who sold the patent rights of a very profitable prescription drug to the St. Regis Mohawk Tribe in order to delay the introduction of generic drug competition. Belmont’s team of Eric Rall, Amanda Portillo and Jon Casel won their initial Bracket Competition over Clemson University, Georgetown University and last year’s winner, the University of North Dakota. After competing in the second round, Belmont advanced to the Final Round where they were awarded fourth place overall. The team was coached by Massey College of Business faculty Boyd Smith, Jennifer Fowler, Barry Padgett and Harold Fogelberg.